Quick, what is your favorite Corvette? I know most of you will say the new one but in this blog entry you have to pick one year except that. 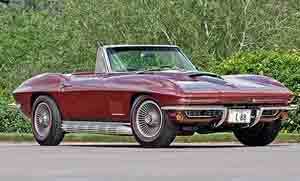 1953, the first year, or 63 split window, or a 1967 Corvette L88 Convertible. Just one of 20 produced during that year, this rare breed made history for its $3.2 million price tag at the Mecum Auction in Dallas recently, the highest price ever achieved for a Corvette at any auction! My favorite is the 63 split window just because it looks cool. I know they all do. One cool one was on display at the 2014 Chicago Auto Show. Split window looks with all kinds of new stuff produced by Lingenfelter Performance Engineering. Mark and I caught up with Ken Lingenfelter, the guy who came up with the idea for the ultimate dream machine. Check out the video. Previous Post2014 Mazda3i 4-door Grand TouringNext PostA bug that breaths fire!